The very words give me the chills: ancient aliens. In the early 1970s, when Erich von Däniken first released Chariots of the Gods, he called them “ancient astronauts”—a name that’s equally creepy. The Apollo missions were still going on, and the image of astronauts was fresh in everyone’s minds. Could ancient alien beings have arrived on Earth in the distant past? Would they have worn spacesuits, like our own astronauts? If they truly visited our planet in millennia past: why were they here? What did the aliens do while they were on Earth? 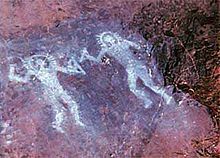 Although we may not be ever know for sure that we had extraterrestrial visitors thousands of years in the past, perhaps if they did come, they might have left us modern people some clues. Let’s take a look at some of the most clear—and startling—evidence for the existence of ancient aliens on Earth. 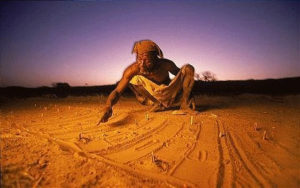 Ancient Aliens Visit the Dogon Tribe? The Dogon tribe and the Sirius Mystery are amazing enough that we’ve covered them elsewhere. This African tribe (whose name is pronounced “DOE-gone”) has known all sorts of specifics about the star Sirius for thousands of years, passed down from holy man to holy man. We’re talking details here, like how Sirius has a companion star (“Sirius B”), and that it circles the main star (“Sirius A”) every 50 years. Here’s the thing: it is absolutely true—but modern scientists didn’t know these things about Sirius until the middle of the 19th century. The Dogon knew a thousand years ago. Heck, the Dogon also knew that Sirius has a second companion star, and scientists didn’t discover it (“Sirius C”) until the 1990s. How did the Dogon get this scientific information about Sirius B? If you ask them, they’ll tell you that the tribe was visited by the Nommos, an amphibian-like race that came from the Sirius star system in a noisy “ark” that spun and whipped up wind while it landed. It was the Nommos, a race of ancient aliens, who told the Dogon about their homeworld and its star cluster. Knee-jerk skeptics like to invent reasons why all this can’t be true. Westerners must have stopped by and told them about Sirius, one denier said. There’s no way, though: the Dogon have artifacts that are thousands of years old, depicting Sirius and its companions. No one should have known this stuff that long ago, but the Dogon did. Holy Scriptures Contain Account of Alien Contact? Ask Erich von Däniken, the guy who pioneered the search for ancient aliens, and he’ll tell you his favorite evidence is in the Old Testament. It’s the story of Ezekiel and his bizarre encounter with UFOs. Ezekiel was a prophet living in exile with the rest of the Hebrews in the land they called Babylon. Being a prophet was a highfalutin job back then, but Ezekiel’s life got even stranger—stranger than just being a guy who received special messages from the creator of the universe. I looked, and I saw a windstorm coming out of the north—an immense cloud with flashing lightning and surrounded by brilliant light. The center of the fire looked like glowing metal, and in the fire was what looked like four living creatures. In appearance their form was human, but each of them had four faces and four wings. Some people read this and think: the dude was taking drugs. Others (knee-jerk skeptics) say: oh, it’s just more Biblical mumbo-jumbo. Devout people may say that Ezekiel saw angels. 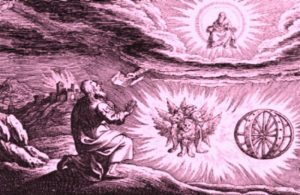 What if this was Ezekiel actually saw something, and he didn’t know what it was, or how to explain it? If he actually encountered ancient aliens, how would he describe them? We think he’d probably describe them just like he did. Next Ezekiel describes the machine that the being had arrived in, the machine that landed in a rush of wind. wheels. Did he meet ancient aliens? I saw a wheel on the ground beside each creature with its four faces. This was the appearance and structure of the wheels: They sparkled like topaz … each appeared to be made like a wheel intersecting a wheel. As they moved, they would go in any one of the four directions the creatures faced; the wheels did not change direction as the creatures went. Doesn’t that sound like a spacecraft to you? Why would a man living 500 years B.C. write a description that sounds so much like the landing and maneuvering of an alien ship? Surely this was not just random. Remember: Ezekiel was devoutly religious, and he would interpret amazing events as signs from God. If beings appeared, he would assume they were angels. But perhaps they were ancient aliens. What about their technology? Ezekiel’s description was of an alien craft with advanced maneuverability. This story of the machine that had wheels-within-wheels impressed NASA engineer Joe Blumrich a lot. A wheel that could move in any direction without having to turn—that sounded like something a planetary exploration vehicle could use. He went on to invent a wheel based on Ezekiel’s description, and called it the “omni wheel.” Joe received a US patent for it in 1972. Today, omni wheels are routinely used in robot vehicles. 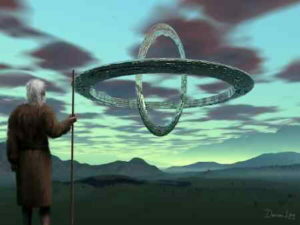 Blumrich also wrote a popular book, The Spaceships of Ezekiel, in which he explained that after starting out intending to disprove the idea, he’d become convinced that Ezekiel truly had been writing about an encounter with ancient aliens. The ancient Sumerians lived 5,000 years ago in what’s now the country of Iraq. They left behind humankind’s first writings, books older than the Bible and the Hindu Vedas. The Sumerians wrote a lot about the Anunnaki, whose name means “those who came from the skies to Earth”. 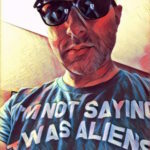 Modern scholars have assumed that the stories of the Annunaki were just myths about Sumerian gods—but the stories themselves sound more like tales of ancient aliens. 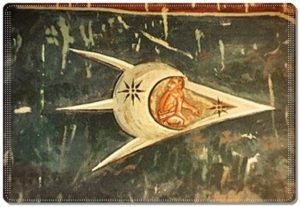 In the writings, the Annunaki came to Earth from a lost planet in our solar system—one with such a wide orbit that it rarely approaches us. They called the planet Nibiru. The leaders of the ancient aliens were named Enki and Enlil. They were here for gold, a mineral they needed but did not have enough of. Mines were set up there in Sumer, but also in Africa as well. Vusamazulu Credo Mutwa, a Zulu elder and author of Zulu Shaman: Dreams, Prophecies, and Mysteries, says that ancient tribal traditions speak of “visitors from the stars” who mined for gold. After mining for some time, the Anunnaki realized that the local humanoids—Homo Erectus, our ancestors—might make useful slaves if they could make them smarter. After improving the proto-humans, presumably with DNA modification, they managed to create a hybrid race: part Anunnaki, part early human. These new beings, called the Adamu, were the first real humans. They were also the new slaves who would work in the gold mines. Our hybrid ancestors didn’t stand for this situation for long, though, probably because these newly created beings were far too smart. Who wants to be a slave? They eventually rose up and rebelled, and eventually, a new Adamu society formed, one which maintained an uneasy truce with the Anunnaki. The Sumerians recorded this history after first inventing writing. 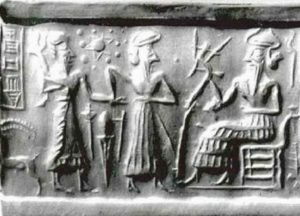 They also made engravings and art of the Anunnaki along with knowledge they had received from them—for instance, an ancient Sumerian seal depicts the Sumerian “gods” along with an accurate representation of our solar system, with 11 planets. The planets have correct proportions (Jupiter is the largest, then Saturn, and so on), and the depiction also includes the asteroid belt. 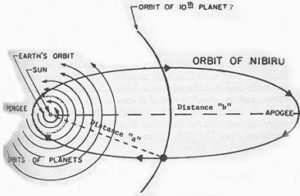 Remember that modern science only discovered Uranus and Neptune in the past 150 years, and that scientists are only now saying that there is gravitational evidence for a “lost” planet with a weird, oblong orbit. Are there truly 11 planets? It may be so. Sumerian artwork always depicts members of the Anunnaki as having wings. Did they actually have wings? It seems unlikely—many researchers believe the wings are meant to show that the Anunnaki had the ability to fly, as in ships. Other strange and telling things appear in the artwork: the goddess Ishtar’s symbol, which stood for the concept of “life”, bears a striking resemblance to the entwined double helix of DNA. Could that be more than a coincidence? We’ve been kind of critical of the show Ancient Aliens, but this segment from an early episode explains all this pretty well (below). 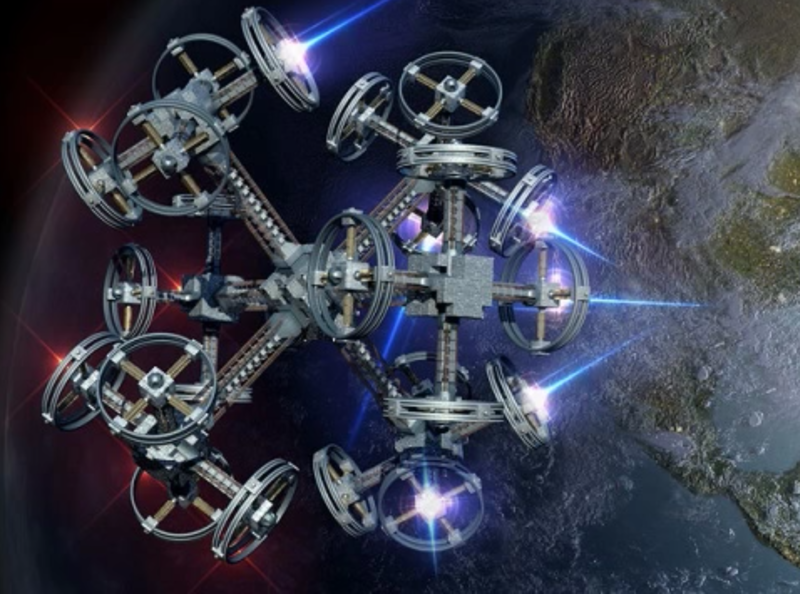 We also very much like this documentary about the Anunnaki and the planet Nibiru. 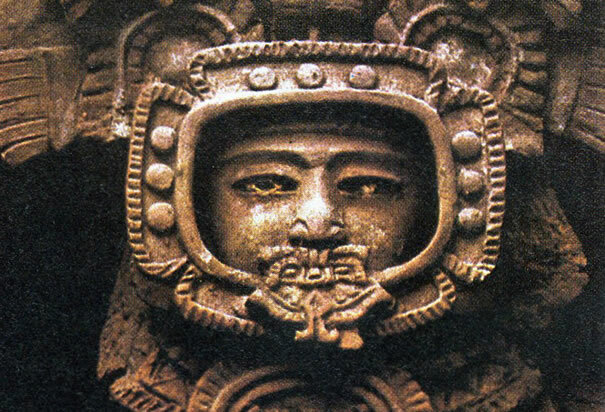 There is strong evidence that ancient aliens visited other places around the Earth. In India, for example, the ancient holy books known as The Vedas tell of a space war between ships and fought in the skies. The descriptions of the ships are remarkable—translated, it is difficult to imagine that they were describing anything except spacecraft. No, that’s not a spacecraft they’re describing. No way. “Fifty years of researching this ancient works convinces me that there are living beings on other planets and that they visited Earth as far back as 4,000 BC. There is just a mass of fascinating information about flying machines, even fantastic science fiction weapons that can be found in translations of The Vedas, Indian epics and other ancient Sanskrit text.” That’s Dr. Vijaya Raghavan, speaking; he was head of the Sanskrit department of the University of Madras in India (now retired). His job, if it’s not obvious, was to study The Vedas; his conclusion was that they described real events in which aliens came to Earth. In other parts of The Vedas, we get a description of something that can only be a nuclear explosion. So what do we make of that? Just ancient imagination that happens to sound exactly like nuclear devastation? Sure, you deniers and skeptics, sure. You’re probably right. It’s ancient nonsense. Right? Check out Google searches about the Nazca lines, and the Mayan king Pakal at the pyramid of Palenque. We could go on; there’s a lot of strange evidence on our Earth that is dismissed far too easily by mainstream science. Because the universe is mundane, and it has to be mundane—that is, if you’re a knee-jerk skeptic addicted to the idea that the universe is mundane. Now, if you want to see the original film that inspired all this hysteria, it’s below: Chariots of the Gods, from the early 1970s. Yes, sure, it’s cheesy—it’s from the ’70s! But it’s still pretty cool, we think.